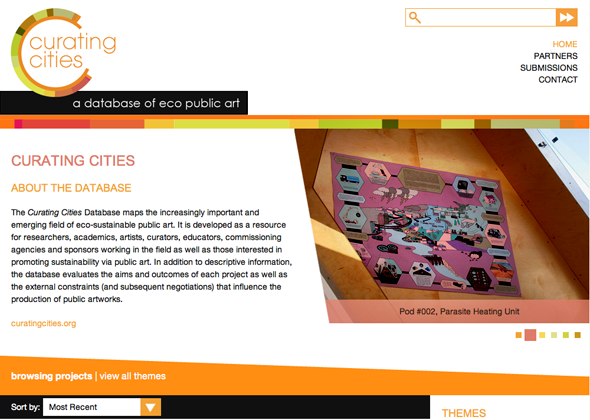 The ‘Curating Cities’ database is developed as a resource for researchers, academics, artists, curators, educators, commissioning agencies and sponsors working in the field as well as those interested in promoting sustainability via public art. In addition to descriptive information, the database evaluates the aims and outcomes of each project as well as the external constraints (and subsequent negotiations) that influence the production of public artworks. Curating Cities is an Australian Research Council funded Linkage project led by Professors Jill Bennett and Richard Goodwin, and Chief Curator Felicity Fenner of the National Institute for Experimental Arts (NIEA) at the University of New South Wales’ College of Fine Arts. Linkage Partners: City of Sydney, Object: Australian Centre for Design, Carbon Arts, University of Cincinnati. Research Team: Jill Bennett, Felicity Fenner, Richard Goodwin, Jodi Newcombe, Adrian Parr, Margaret Farmer and Kerry Thomas. Scores of Seattleites have been crocheting for months to create artist Mandy Greer’s “Mater Matrix Mother and Medium,” a 200-foot fiber “river” among the trees at Camp Long. Greerr installs the piece this week at Polliwog Pond. It’s part of a spring and summer of temporary public artworks, performances and films commissioned by the Seattle Office of Arts & Cultural Affairs “to celebrate the splendor of Seattle’s urban creeks” and encourage stewardship of essential watersheds. They include “Waterlines,” a performance in Volunteer Park where Stokley Towles traces the city’s water flow through interviews with city utility employees; a large, biodegradable water tower at the Bitter Lake Reservoir by John Grade; artists’ new short films on the work of Seattle Public Utilities; and a residency on the Fremont Bridge, plus a neighborhood art project, by Kristen Ramirez. via APInews: Seattle Celebrates Urban Creeks, Watersheds.